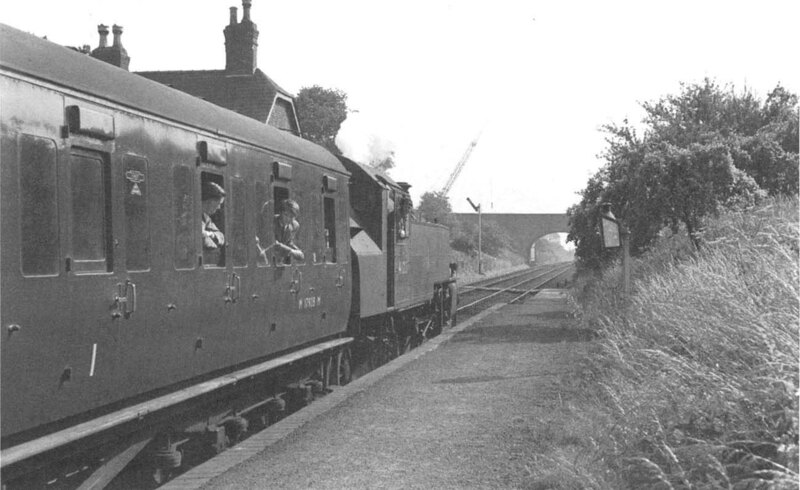 Another view of Ivatt 2MT 2-6-2T No 41227 which is seen in push mode on the last day of passenger services on 13th June 1959. The train was motor fitted meaning the driver was located in a driving compartment situated in the first coach. This was equipped with controls to allow the driver to operate the locomotive. The fireman however still needed to remain on the locomotive's footplate and its him that can be seen hanging out the locomotive's cab window. Built at Crewe in October 1948 No 41227 was only 16 years old before it was withdrawn from service at Nine Elms shed on the Southern Region in September 1964.